The 30-year-old playmaker has featured sporadically for the Gunners so far this term. Since joining Arsenal in 2014, Mesut Ozil has often divided opinion amongst the Gunners fanbase. Some believe his apparent lack of work ethic and nonchalant mannerisms make him an expendable luxury, whereas others feel his quality and class on the ball is justification for his inclusion in Arsenal’s starting XI. Whether pro or anti-Ozil, it’s clear that his relationship with Unai Emery is fractured at best, with the Spaniard once again leaving Ozil out of the squad for the trip to the London Stadium. Ozil is Arsenal’s current highest earner, pulling in a sizeable £350k p/w wage. With Emery making headlines in recent weeks regarding his comments about Arsenal not being able to buy players due to financial restrictions, Ozil’s wage has been the subject of intense scrutiny. The ex-German international is very much a specialist player. Operating best in the number ten role behind the striker, where he is able to roam freely, pick up pockets of space and create chances. However, when Emery has deployed a 4-2-3-1 system this season, he has preferred the dynamism of Aaron Ramsey at number 10, rather than the artistry of Ozil. This could be an indicator that Emery does not see value in the type of player Ozil is. Perhaps preferring a more workmanlike midfield, with Ozil’s playing style being a luxury the team can ill afford. Despite leaving Ozil out the team in an attempt to make the Gunners a more solid outfit, Emery’s side are still leaking goals at an alarming rate. The north Londoners have conceded 32 league goals, just five fewer than Huddersfield, who sit bottom of the table. Only Liverpool and Manchester City have outscored Arsenal in the Premier League, but the Gunners’ inability to keep clean sheets has cost them crucial points. With this in mind, it might be an idea for Arsenal to play to their strengths and outscore the opposition - surely Ozil could be of assistance in this regard with his creativity? In just 13 league appearances, with one coming as a substitute, Ozil has scored three goals and produced one assist. The opportunity to play with the likes of Alexandre Lacazette and Pierre-Emerick Aubameyang and a regular basis could see those numbers skyrocket, whilst enhancing Arsenal’s chances of winning matches. It seems Emery has made his mind up on Ozil, but whilst he has the schemer at his disposal, he should be looking to extract what he can from him, before attempting to move him on. 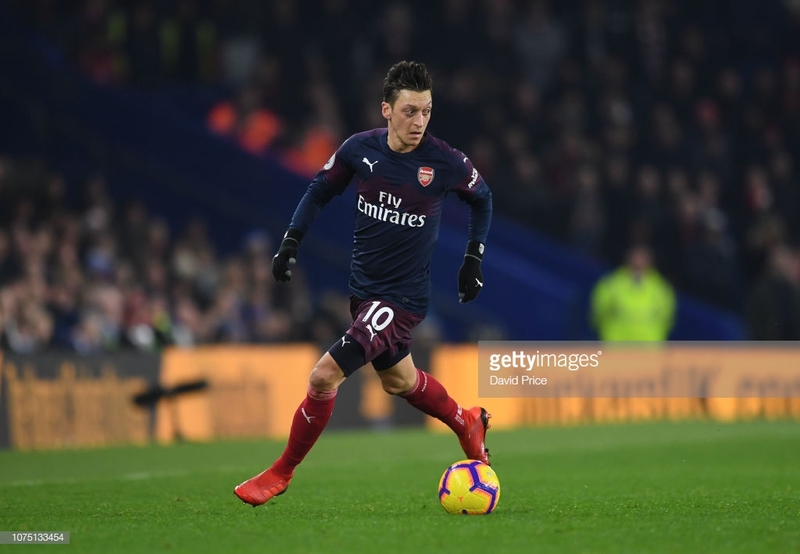 Arsenal are at their best when playing free-flowing football and creating chances in abundance, as it stands, there is no better player on the books than Ozil to help facilitate this style of football.